(CNSNews.com) - Cable news shows on Tuesday accused President Donald Trump of "stoking fears" and even lying about illegal immigration, after President Trump blamed Democrats for having "something to do" with the massive group of foreigners intending to cross illegally into the United States. The "caravan" moving north from Central America is estimated to include 7,000 men, women and children, and Trump has warned that criminals and Middle Eastern terrorists are among them. Liberal media outlets said Trump has no proof and is therefore lying about dangerous people heading north. MSNBC's Joe Scarborough actually compared Trump to Hitler on Tuesday morning, reading a U.S. government psychological profile of Hitler on-air. “This is from the United States Office of Strategic Services in describing Hitler's psychological profile, and this only pertains to Adolf Hitler, it pertains to no one else. I just can't state that enough," Scarborough said. 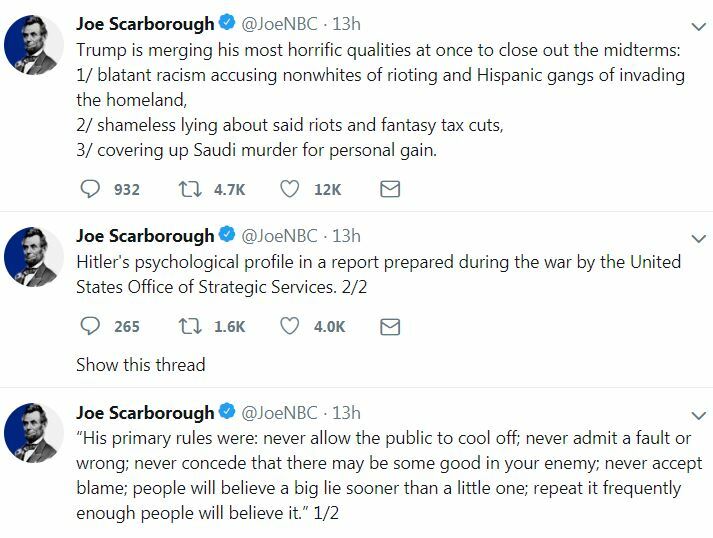 Scarborough also tweeted that excerpt on Hitler. Trump told a rally in Houston last night that Democrats "are for open borders, which means crime...they're against law enforcement, they're totally against ICE." We have a 3.7 percent unemployment. It's the lowest it's been in 50 years. But they have to come in legally. And they have to come in through merit -- through merit. So we started the wall. We got a billion-six ($1.6 billion). We got another billion-six, we have a third billion-six. I want to do it fast. And you know, what's happening now as a large group of people -- they call it a caravan. You know how the caravan started -- does everybody know what this means? I think the Democrats had something to do with it. And now they're saying, I think we made a big mistake. Because people are seeing how bad it is, how pathetic it is, how bad our laws are. They made a big mistake. So as the caravan -- and look, that is an assault on our country. That's an assault. And in that caravan, you have some very bad people. You have some very bad people. And we can't let that happen to our great country, and it's not. And I was just talking to your great governor and senators, talking about your attorney general...But I'm talking to a lot of your people. And they're going to form a wall -- a different kind of a wall, until we get the other one built. We need a wall built fast -- fast. We have to protect our borders. We don't have borders, we don't have a country. We have to protect our borders. The Washington Post reported on Tuesday that Trump "has settled on a strategy of fear — laced with falsehoods and racially tinged rhetoric — to help lift his party to victory in the coming midterms, part of a broader effort to energize Republican voters with two weeks left until the Nov. 6 elections." According to that report, "The president has been especially focused in recent days on a caravan of about 5,000 migrants traveling north to cross the U.S. border, a group he has darkly characterized as gang members, violent criminals and 'unknown Middle Easterners' — a claim for which his administration has so far provided no concrete evidence." The Post said the overall strategy "is to paint a portrait of a chaotic, dangerous world — with Trump and Republicans as the panacea." Cable news shows picked up that theme and ran with it Tuesday morning, saying Trump is repeating lies about the caravan and other issues to scare voters. CNN’s “New Day” had a lengthy “Politics of Fear” segment Tuesday morning, calling the president “unhinged,” among other things. "President Trump is waging a fact-free campaign of fear ahead of the midterm elections that are now two weeks from today,” host Alisyn Camerota said at the beginning of Tuesday’s show. Camerota said this time, there is no "germ of truth" in Trump's "fear-mongering." In a Monday night tweet, President Trump wrote: "Today’s Democrat Party would rather protect criminal aliens than AMERICAN CITIZENS - which is why the Democrats must be voted OUT of OFFICE! #JobsNotMobs"